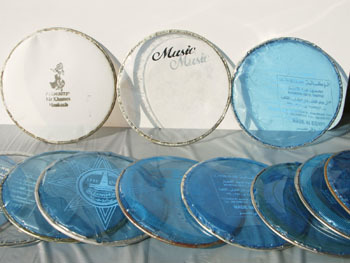 For many years the metal bodied Goblet Shaped drums had plastic skins made from a polyester film called Mylar. Drums from Egypt often have these heads and they are transparent and often have a blueish tinge to them. 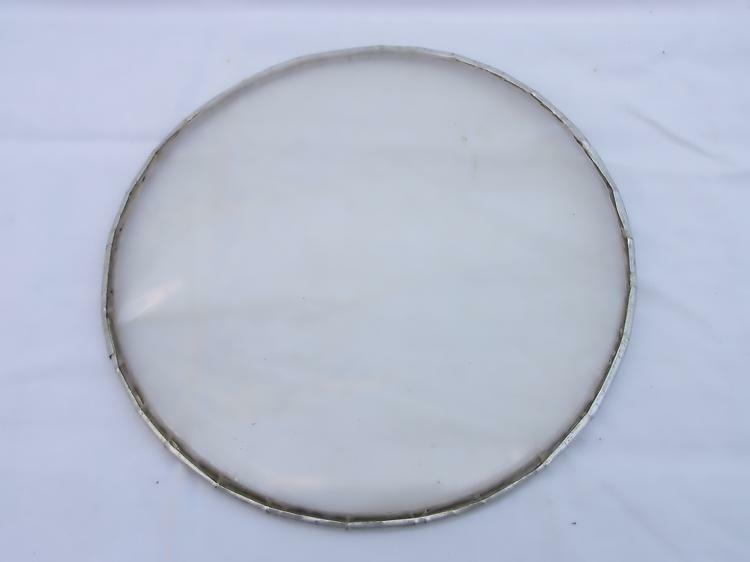 The plastic head has a crimped ring around the circumference of the head, which is placed over the shamber ( rim ) and the detachable top ring is screwed down onto the ring to tighten the plastic skin. 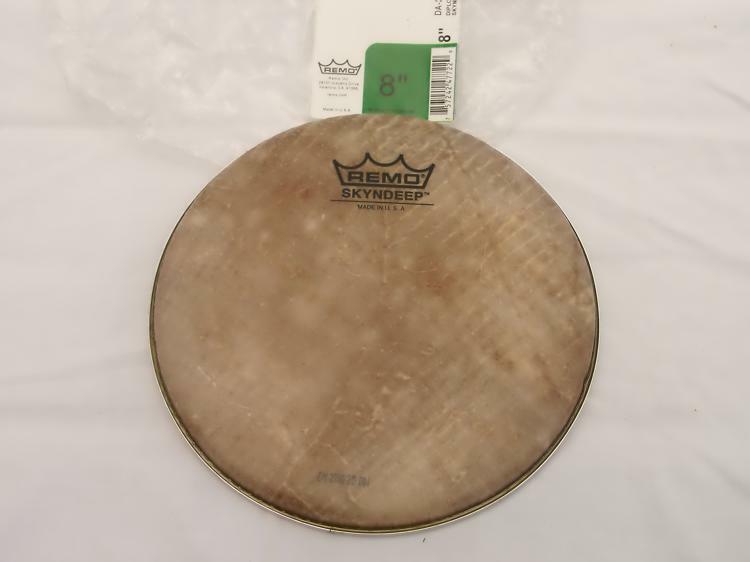 The build quality of these heads is often poor and the plastic edge often pulls away from the crimped ring or it splits around this area which is not visible but you can hear the drum sounds bad. 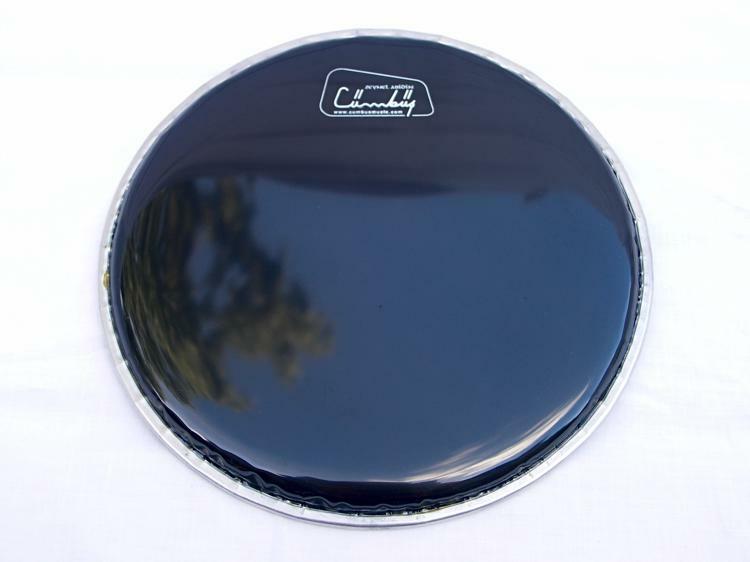 Nowadays companies such as REMO, Powerbeat, Mitello and others are making drum heads which will fit various sizes of Goblet Shaped drums and they can radically alter the sound, often for the better. 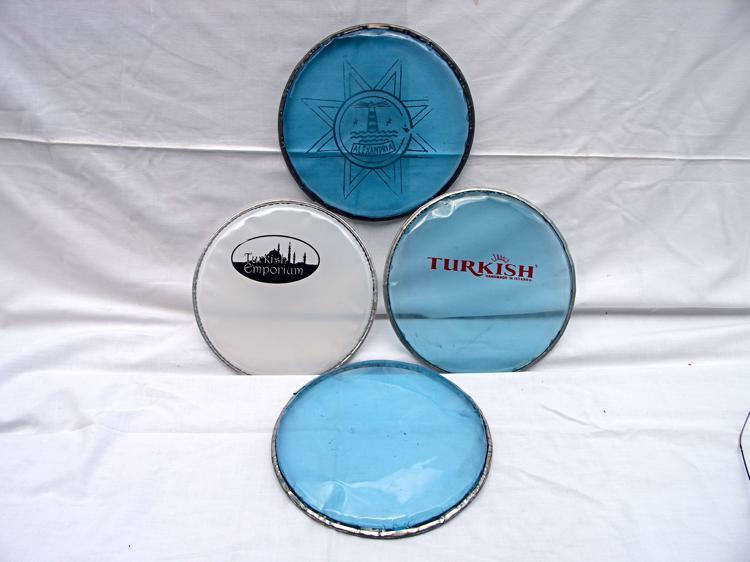 In Turkey you can find many different types of synthetic heads which are different again, some are papery / fibrous and some have an opaque "sugar papery effect" texture. 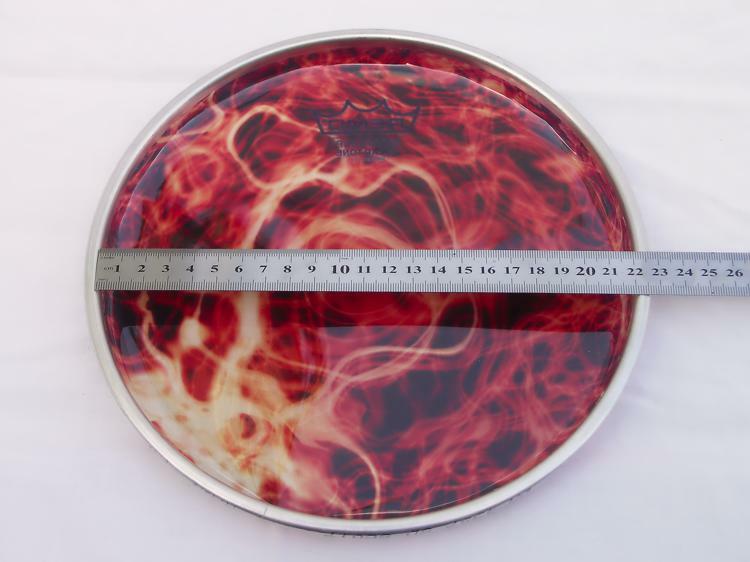 REMO - This US manufacturer of drums and accessories have produced some great drum heads for Goblet shaped drums. 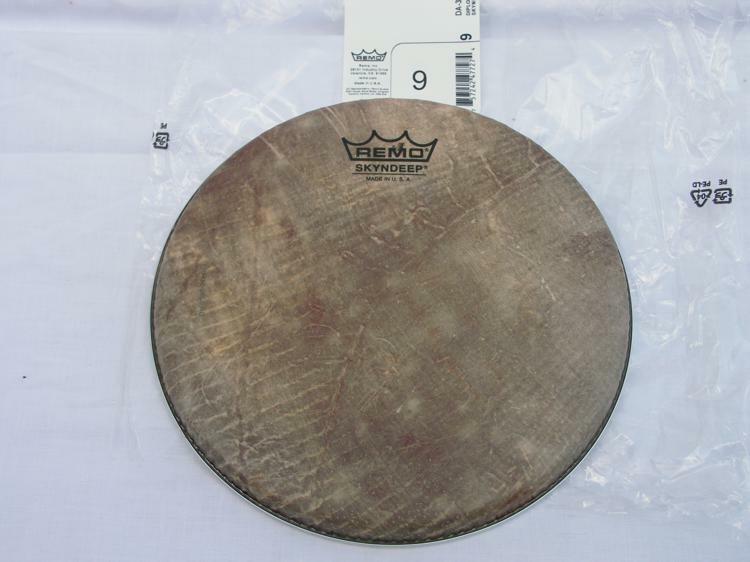 The Skyndeep heads have an imitation fish skin pattern and are attempting to replicate the original sound of a clay bodied / fish skin headed Goblet Shaped drum. 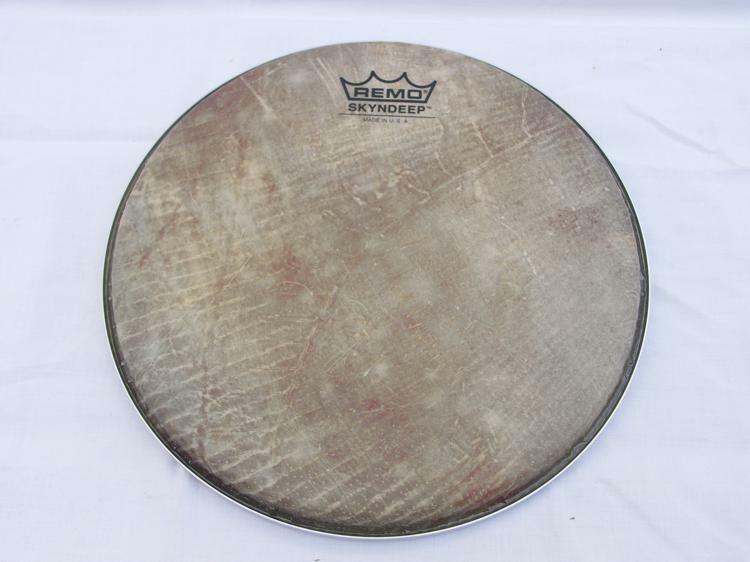 The results are usually excellent resulting in very ringy taks and booming doums. 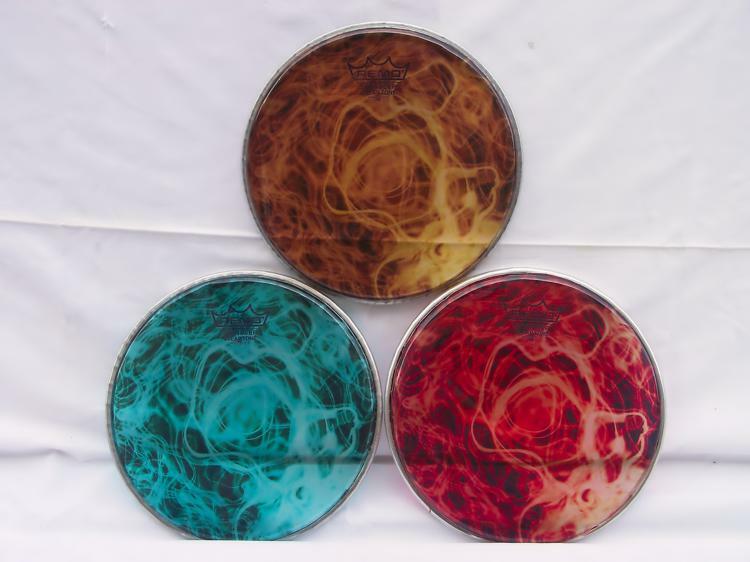 They come in a variety of sizes which will fit quite a few Goblet Shaped drums. 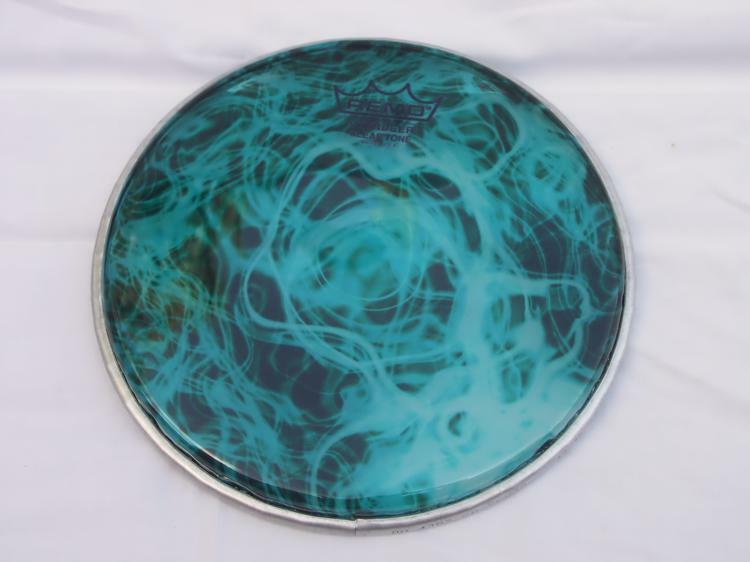 The Cleartone heads have been designed for REMO's own brand doumbek and come in 3 psychedelic patterned designs and sizes for Darabukas and Sombatis. 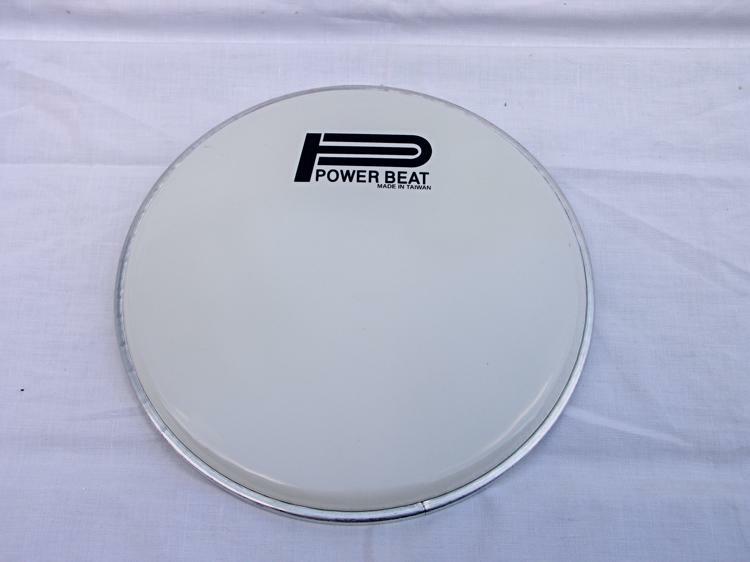 They generally produce sounds similar to the POWERBEAT models. 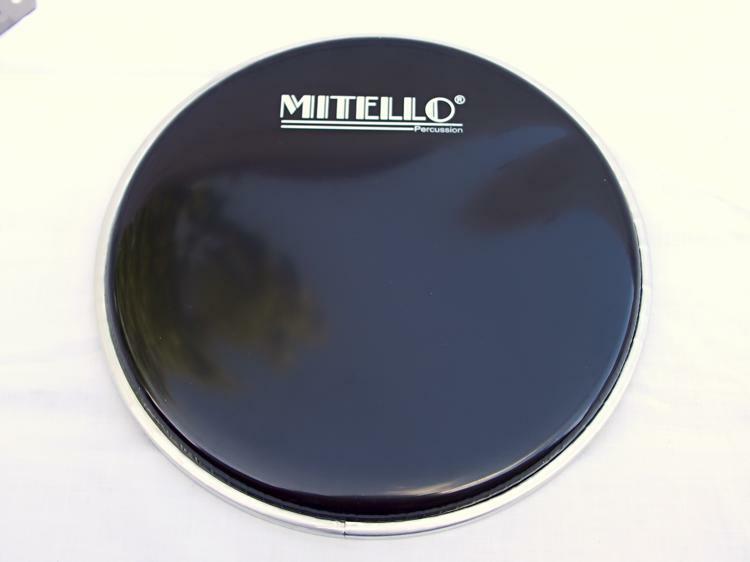 POWERBEAT / MITELLO - Apparently these heads are made by the same manufacturer for different retailers. 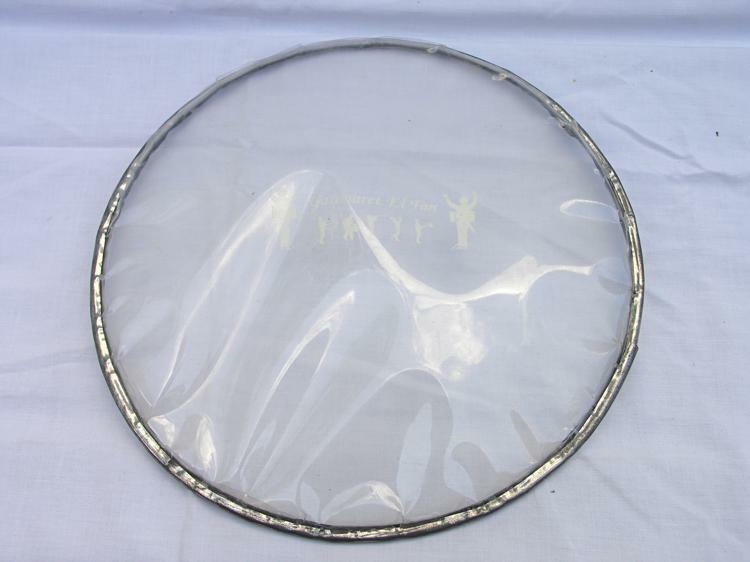 They are thicker and much stronger than the Mylar heads and often produce very high pitch abrupt taks and deep booming doums. 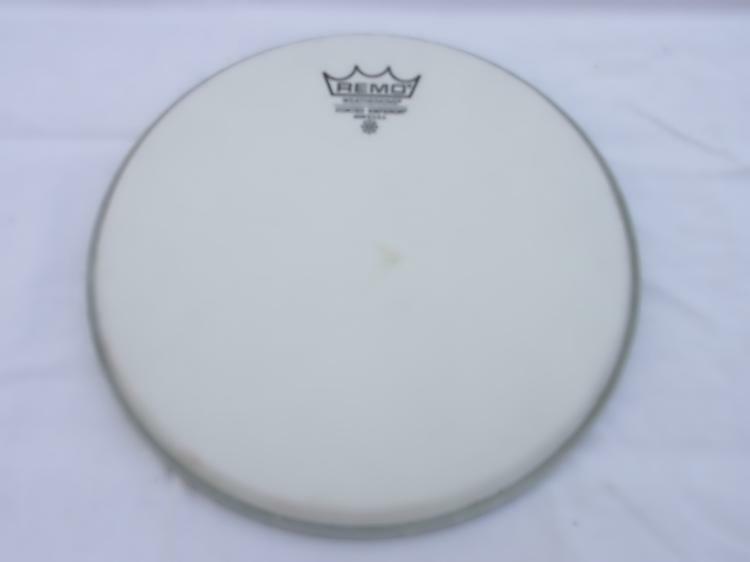 As with the REMOs: the crimped ring is extremely solid and the heads do not pull out of the ring under extreme pressure unlike the Mylars. CUMBUS and KIRMIZIGUL - These heads have good solid rings and the plastic head is thinner than the POWERBEATS. 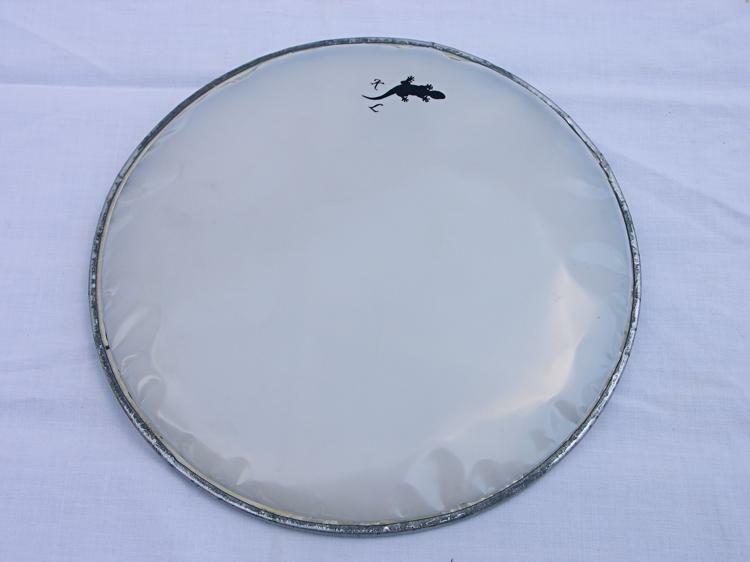 General purpose good all round head which improves the taks and doums of any drum with a Mylar head. 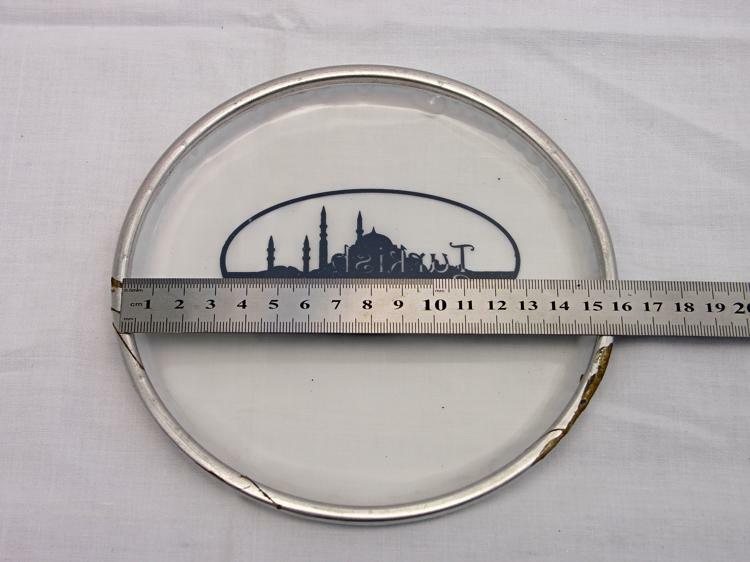 Turkish brand. 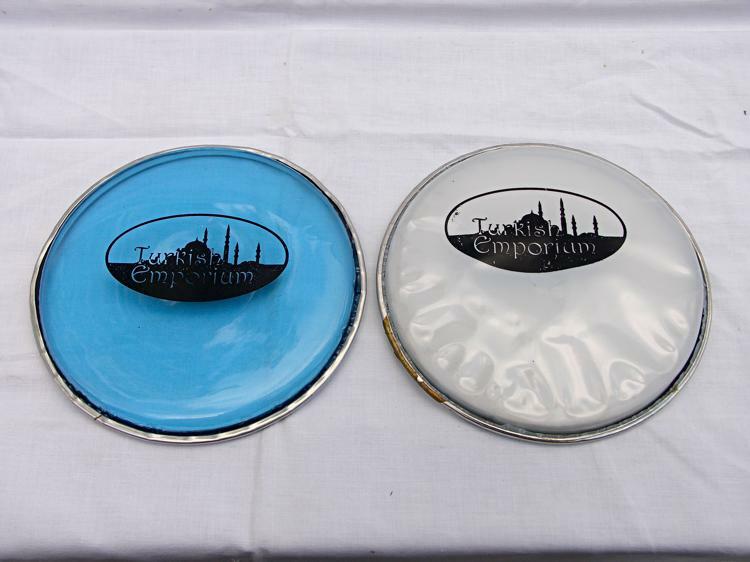 TURKISH EMPORIUM - Similar to Mylar in they are quite thin but they have a good solid ring. 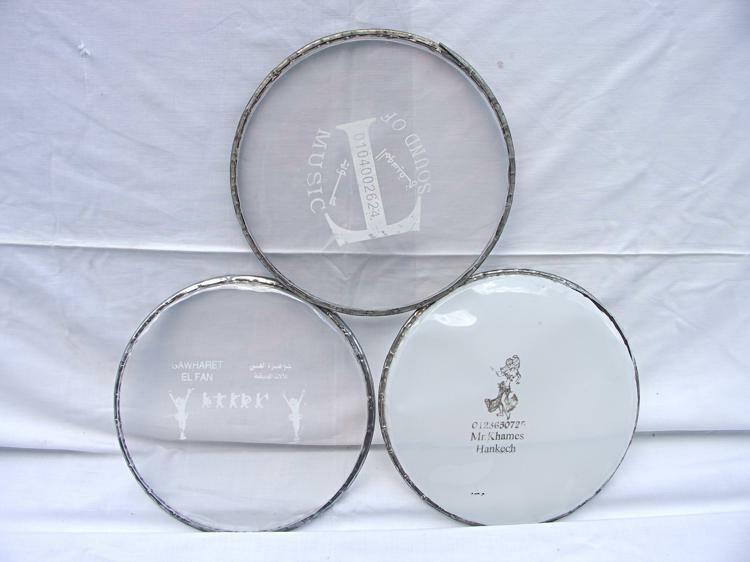 Advantage of these heads is the variety of sizes for unusual sized drums. 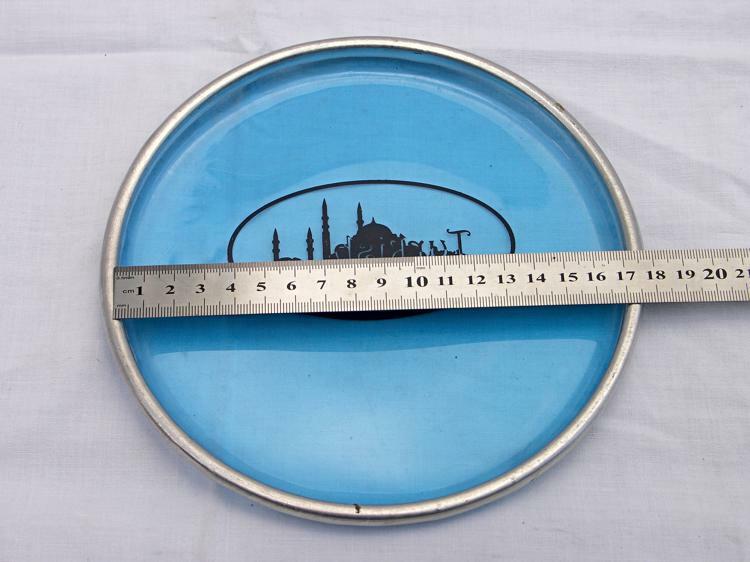 Turkish brand. N.B. 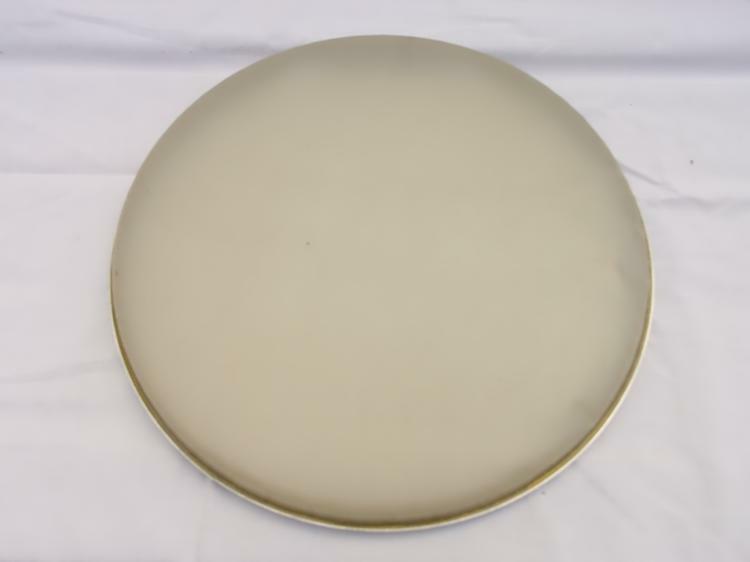 Goblet Shaped drums do vary in their exact dimensions enormously and there is not the standardisation of sizes you may expect. 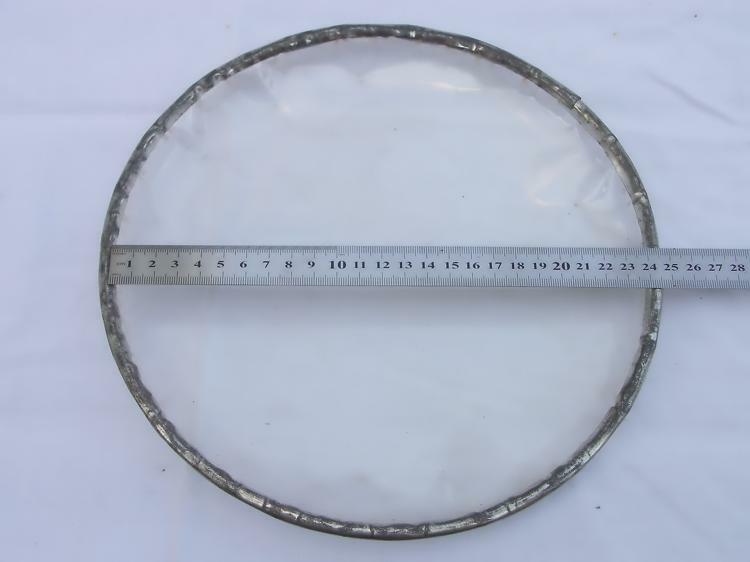 So the distance around the rim ( Shamber ) for fitting the head will vary and so the size of the heads will also differ in size to reflect these variances. I try to describe the dimensions of the heads as accurately as possible. 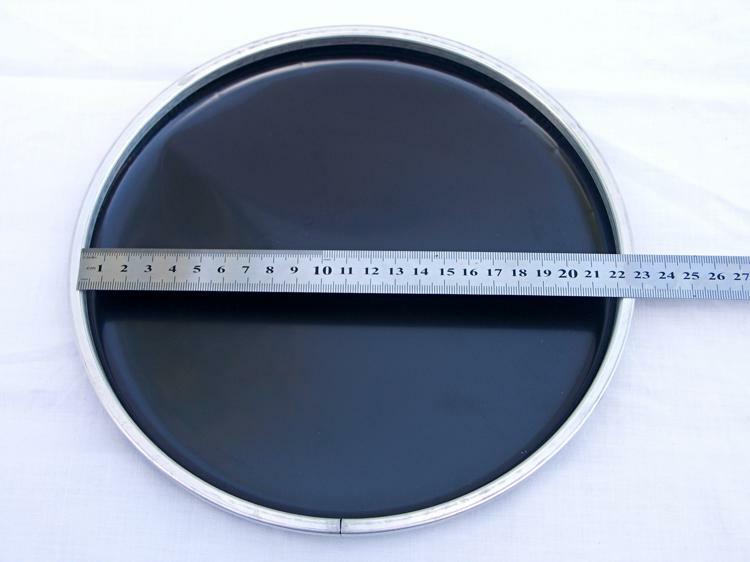 To ensure you order the right one for your drum: measure the widest distance from the OUTSIDE of the metal rim on your drum which the head goes over, and compare to these measurements which are from the widest point of the rim INSIDE the drum head. N.B. 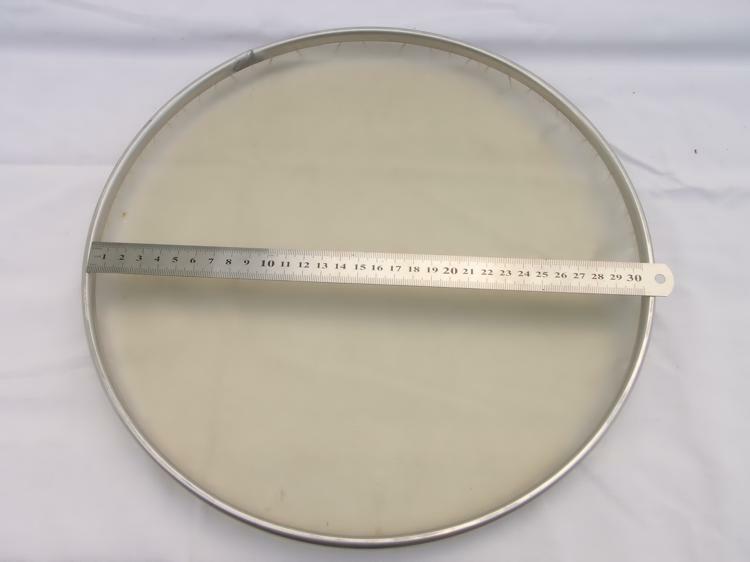 - you have to measure your own drum and be sure of the measurements. 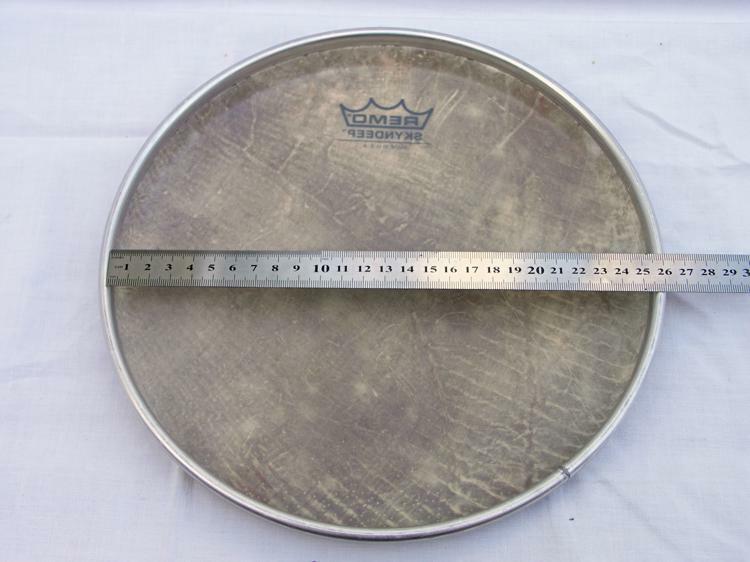 I can NOT tell you which head is right for your drum without me being able to measure it in person. 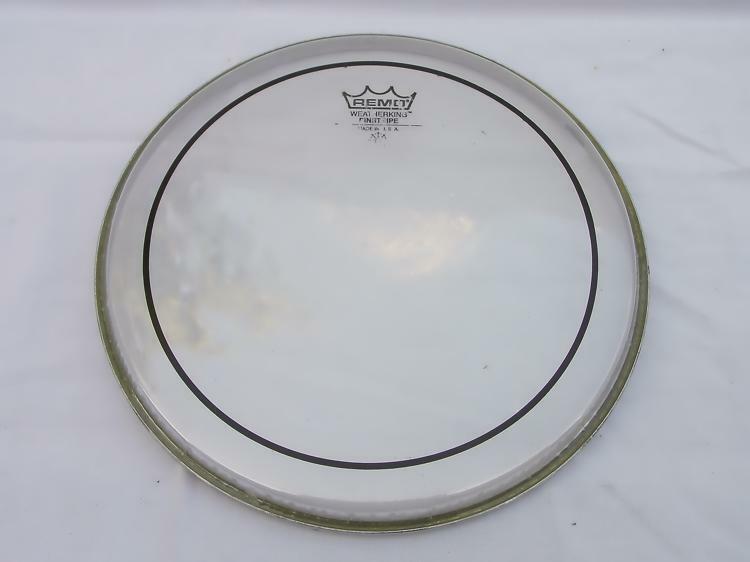 Changing the drum head is not necessarily an easy operation. The head has to be stretched and tightened to quite extreme pressures. 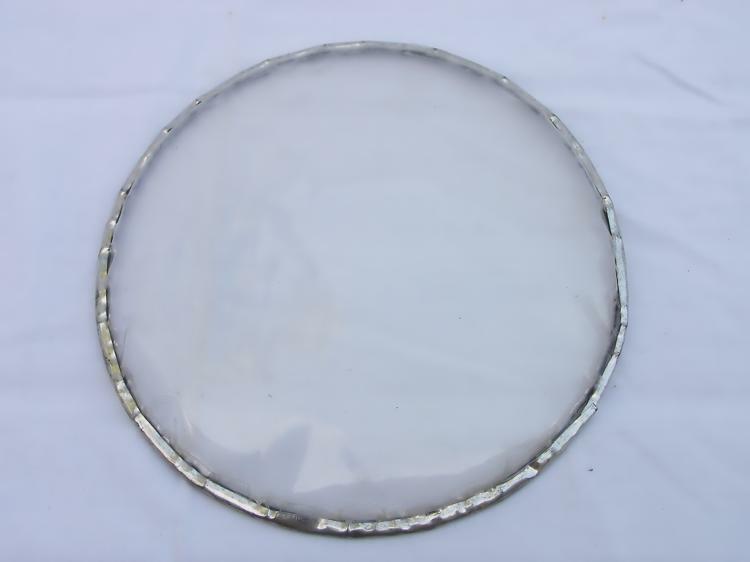 The threads in the main body of the drum which the bolts in the rim will screw into, can tear, which often means the end of the drum! There are methods and advice and I give you those details here. 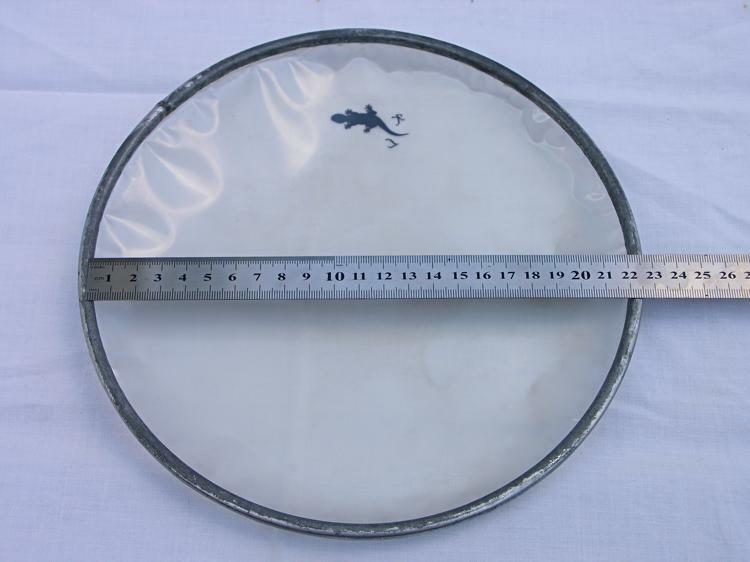 Alternatively if you want me to fit your head then that is possible, either send your drum to me or come and visit, CONTACT me for details. TOO SHALLOW - you need to screw down the head as far as it will go - take a tea towel and fold it once and place on the drum head - take a hot iron and iron the head through the tea towel for around 30 secs - this will loosen the plastic head momentarily and then you can screw down the bolts a little further - you may will need to repeat this process a few times before the head will become flush with the rim. 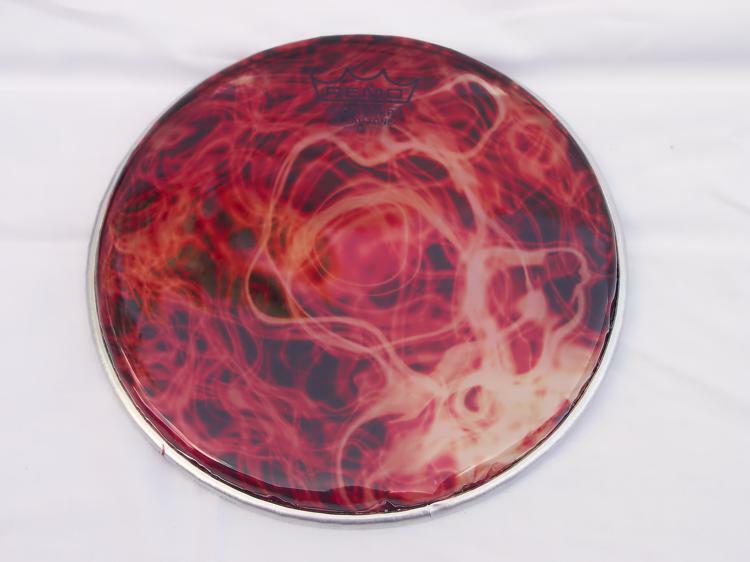 See a video demonstrating this method HERE. UPDATE !! This video has gone - I will make my own and upload one day. TOO DEEP ( more unlikely ) - you can put a piece of nylon cord just on top of the crimp ring, cut to length and join the ends with tape. 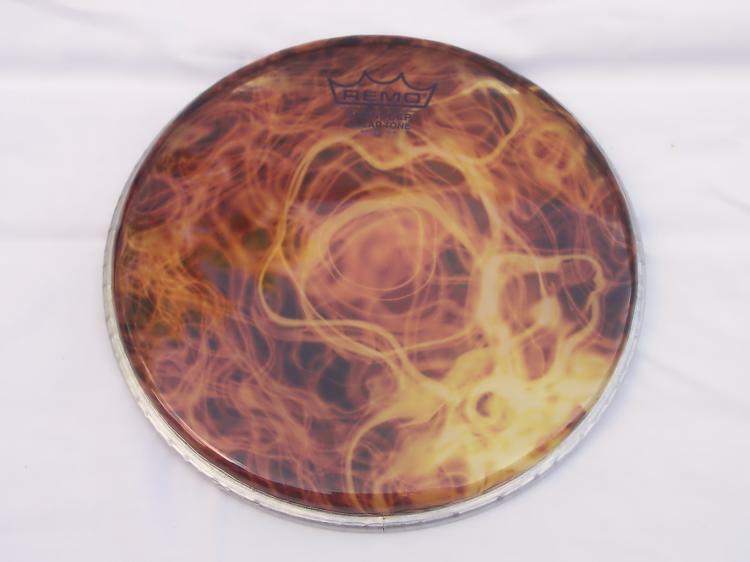 So now there is now something for the rim to screw down on, also you can try using an old head rim without the plastic. Both the above situations are unlikely to occur but if so try these solutions. I will refund any UNUSED head, buyer meets the postage cost to return. Please CONTACT me if you need further help. 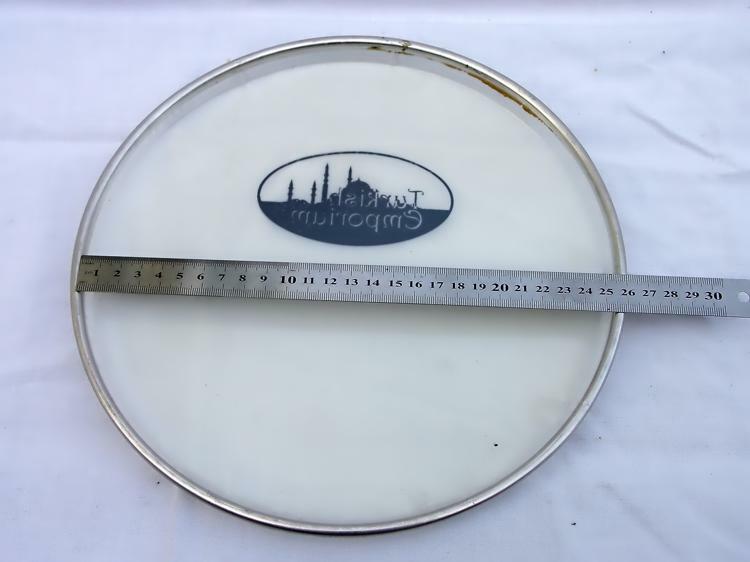 Logo Removing - If you do not want the brand logo on your drum head you can remove them using this method. 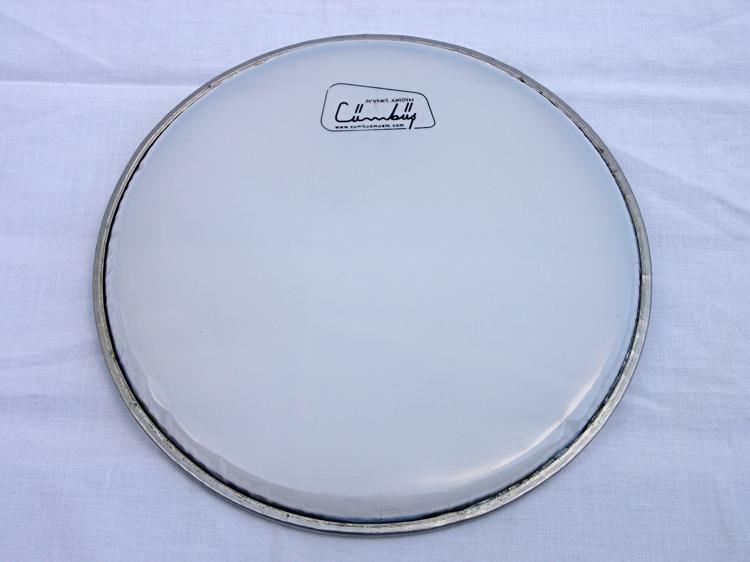 Buy some Cutex Nail Polish Remover and apply some to a towel/cloth/material and then scrub the logo on the drum head. 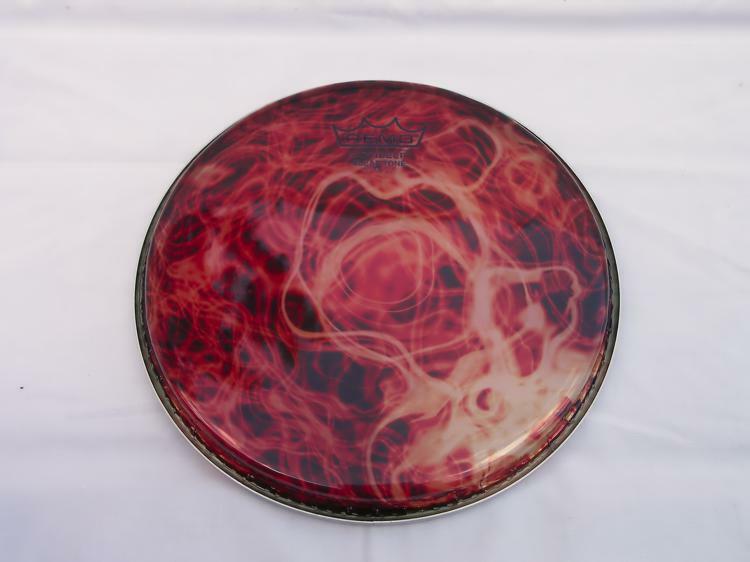 It may take a while and if the material you are using gets very black from the removed dye, then reapply some more with a clean piece of material. 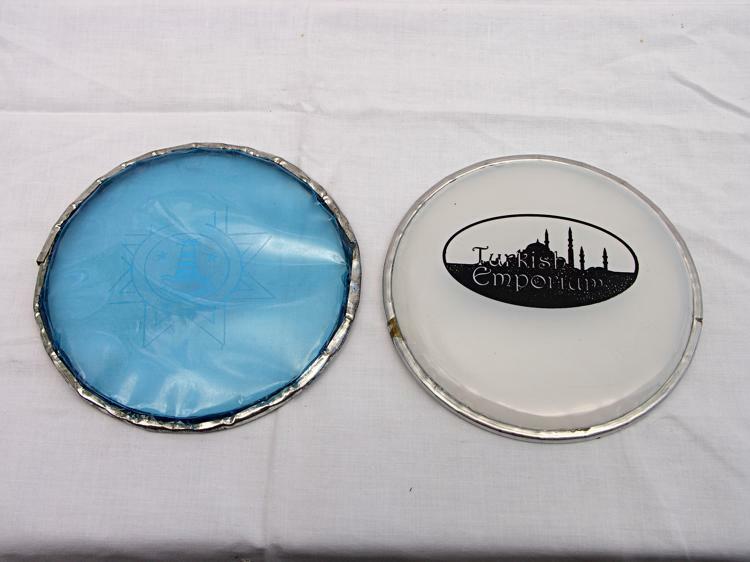 Some logos are more stubborn than others and a soft washing up scrubbing pad may be needed. Eventually the logo should be all removed - N.B. there will most likely be a "ghost" image left on the head which is barely visible. 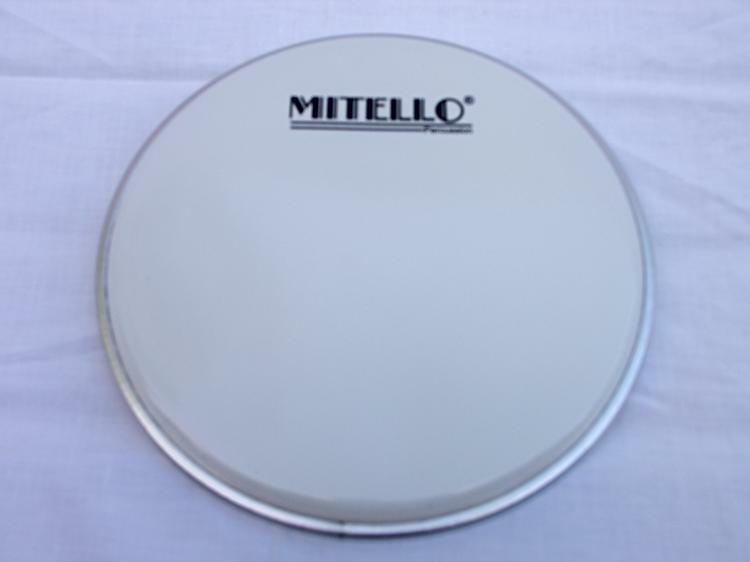 Egyptian and Syrian drums tend to respond well to REMO, POWERBEAT and MITELLO heads. Resulting in high taks and deep doums. 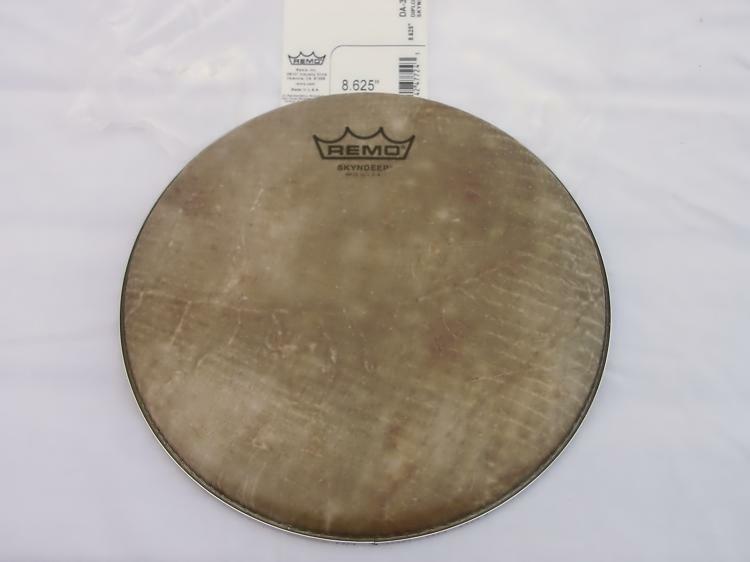 REMO Skyndeep produce ringy taks and POWERBEAT more abrupt and higher pitched taks. Both give deep sustained doums. 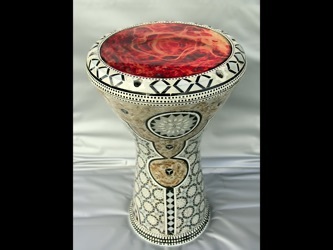 Turkish drums tend to respond better to the heads produced in Turkey. 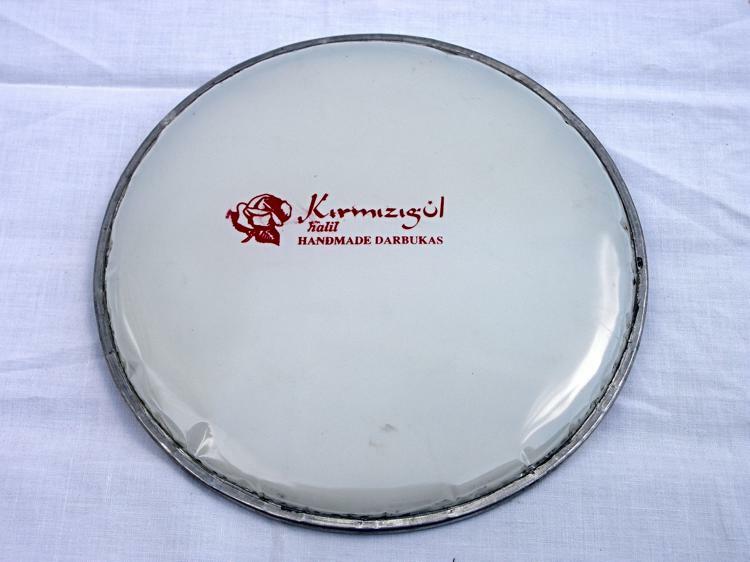 The lightweight "Arab-Style" darabukas sound good with CUMBUS and KIRMIZIGUL heads but REMO and POWERBEAT can often not work at all producing horrible sounds. 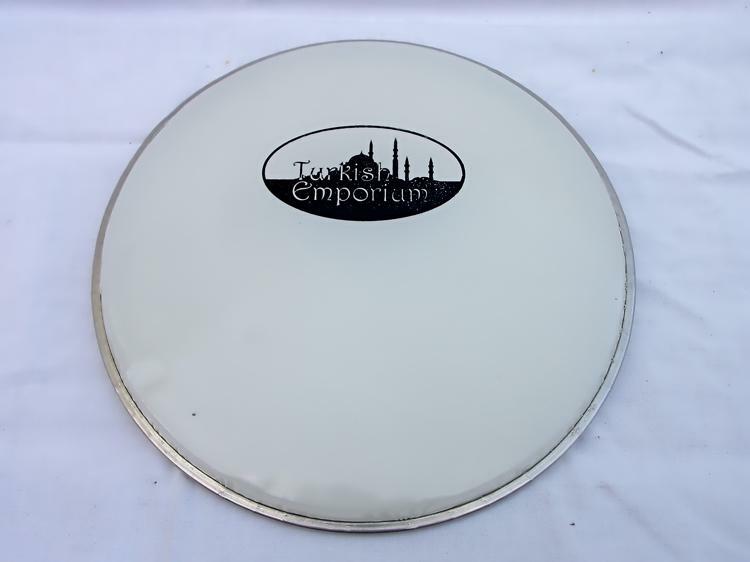 In Turkey they make a papery / fibrous head which seems to respond much better to their drums, especially the lighter ones which are mostly made from aluminium or copper. 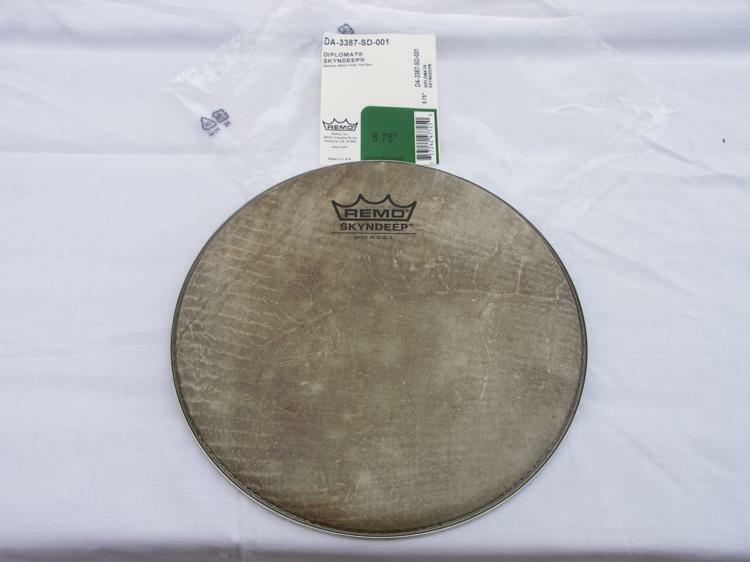 The heavy cast drums made there can respond well to most types of head, one new model is Dr DRUM which has a thick "roughened" finish. 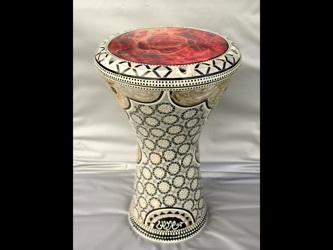 As a general rule Turkish Goblet Shaped drums have very ringy and lower pitched taks and booming doums whereas Arabic produced drums have more abrupt, higher pitched taks and booming doum. HOWEVER!! There are always exception to these guidelines and I am constantly finding out new permutations which can confound expectations. As I usually only have a few copies of each head, at any one time, I prefer to create a personalised invoice for each order which will reflect the P+P charges for each order. So there is no option to "Buy It Now"
Payment can be done through PayPal ( Please note Paypal add a 3.5% Tax to the total including postage ), Bank Transfer or Cheque. Payment for enquiries outside of the UK must be in British Pounds and is by Paypal only. 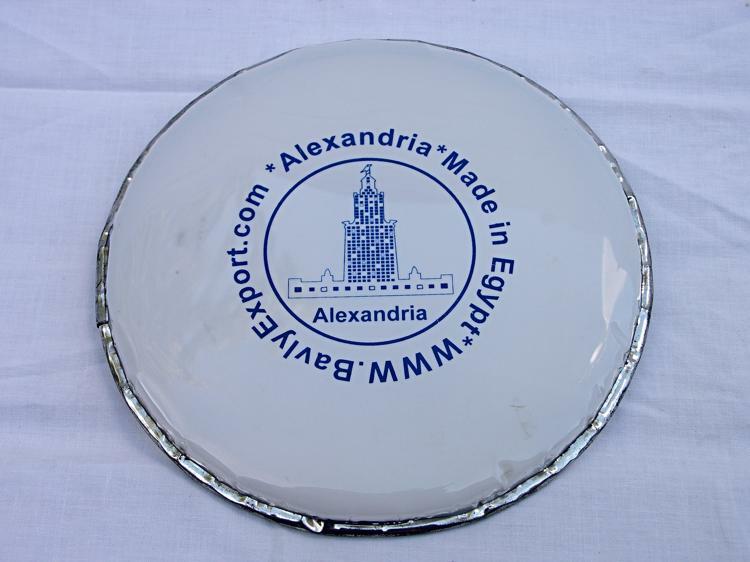 You will be responsible for the payment of any Import Duty / Tax / VAT. 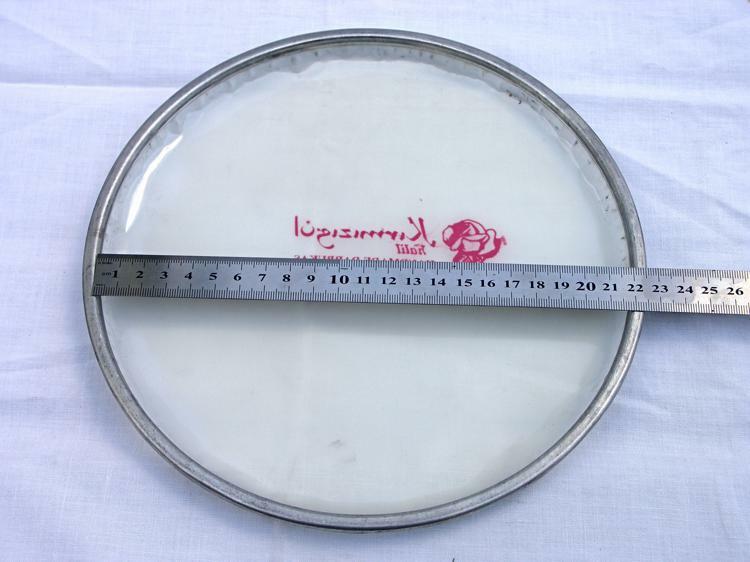 30.5 cm / 12" - may fit "Super" size Dohollas. 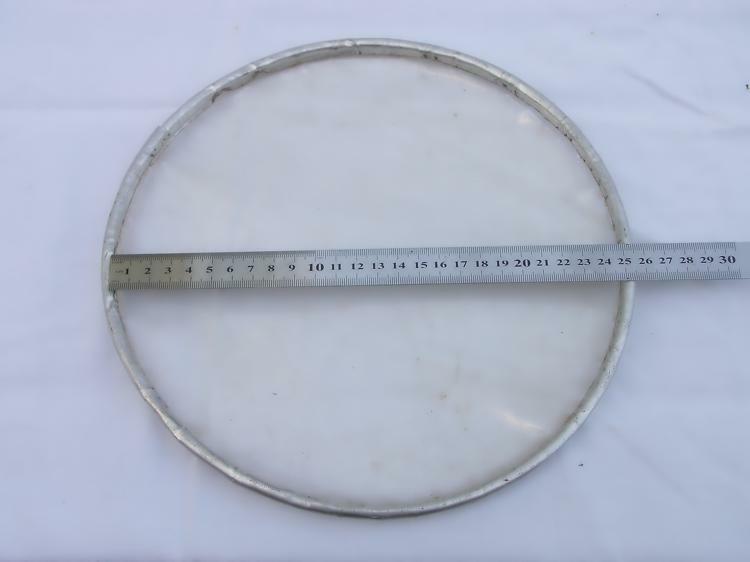 28 cm to 28.5cm - uneven ring hence variable measurements. 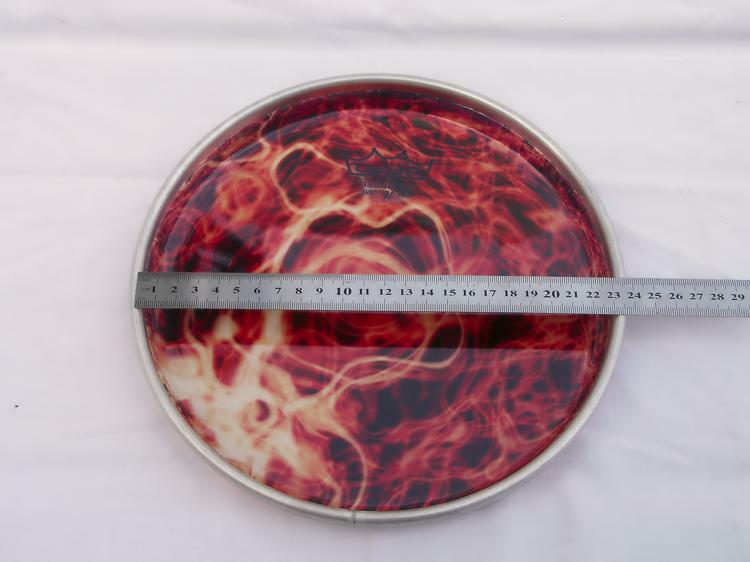 25.5cm / 10" - N.B. USED but should be reusable. 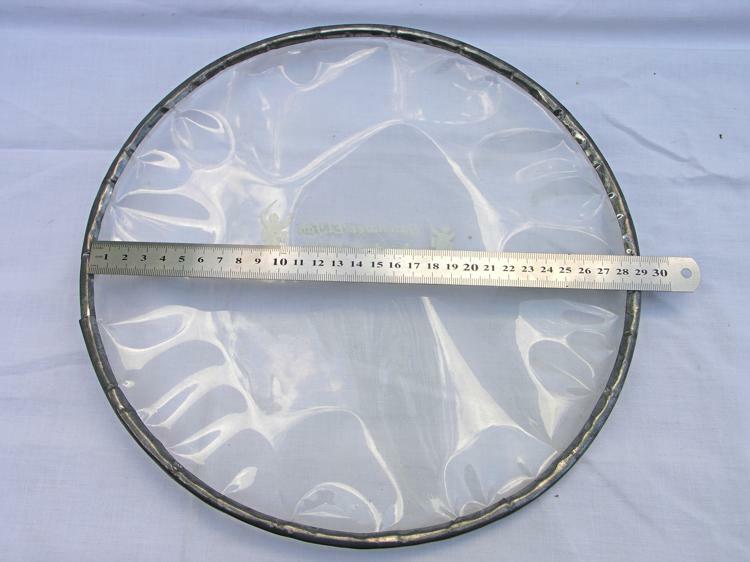 24.5cm - 25 cm - uneven ring hence variable measurements. 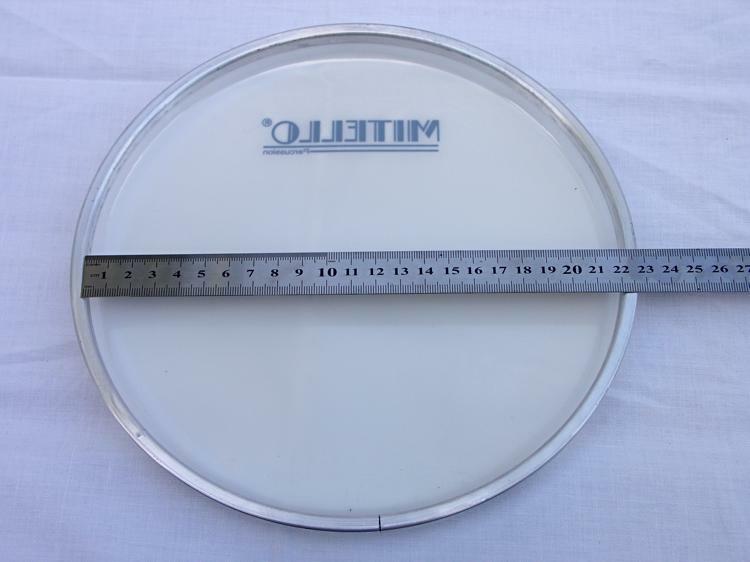 23 cm / 9" - will fit most standard size Sombati drums. N.B. USED but should be reusable. 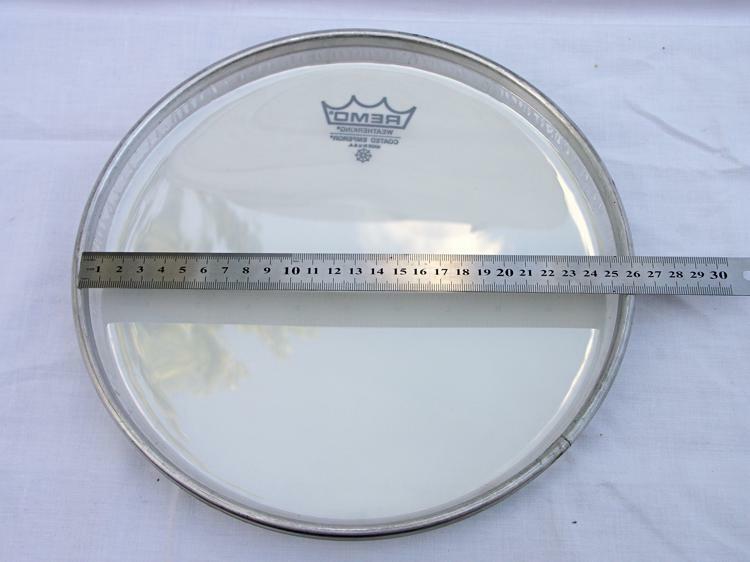 23 cm / 9" - will fit most standard size Sombati drums. 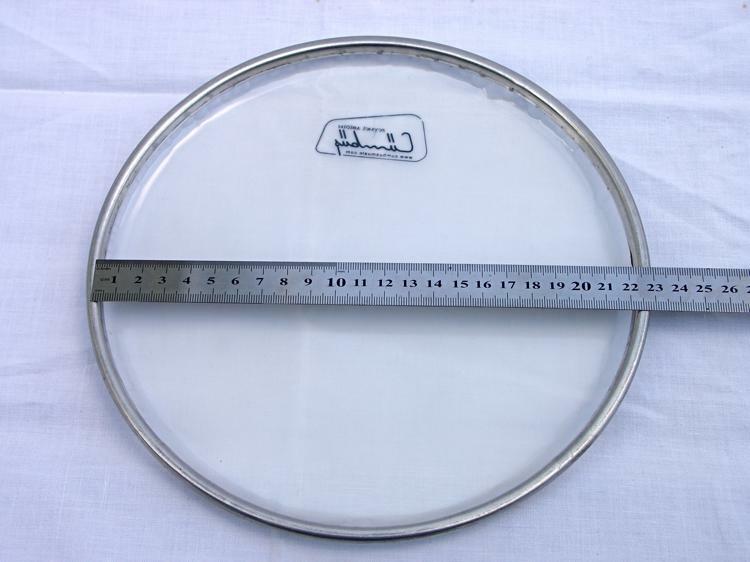 23 cm - will fit most standard size Sombati drums. Black / Silver logo available. 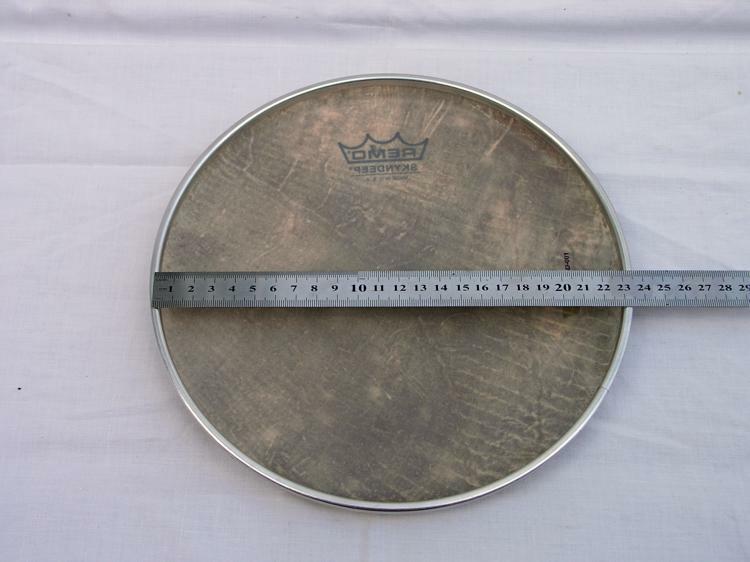 23 cm approximately - will fit most standard size Sombati drums. N.B. USED but should be reusable. Extremely rare and previously unavailable in Europe. 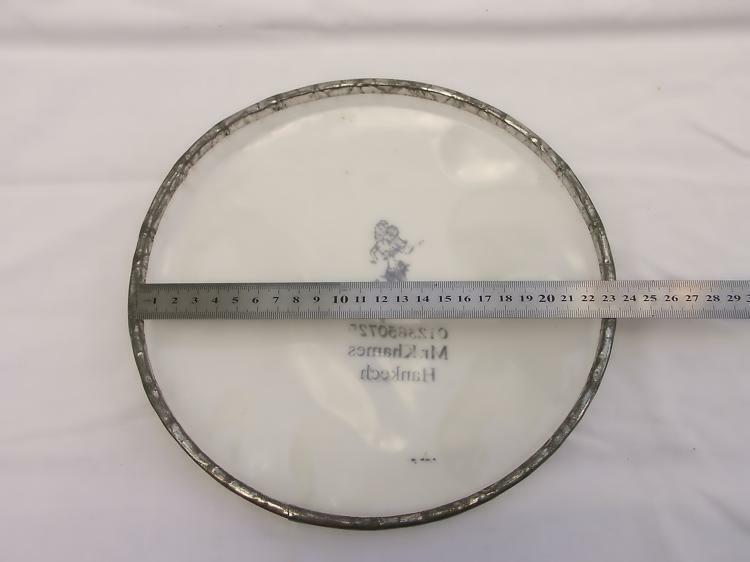 22 cm. 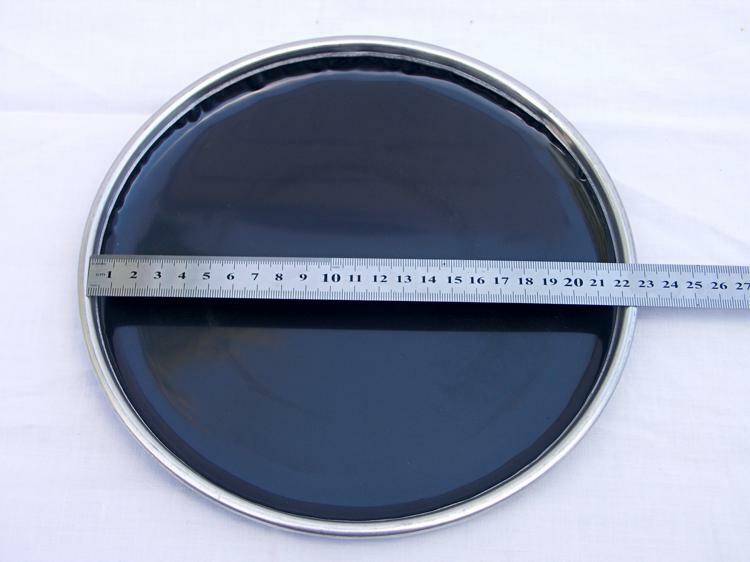 - will fit most standard size Darabuka drums. 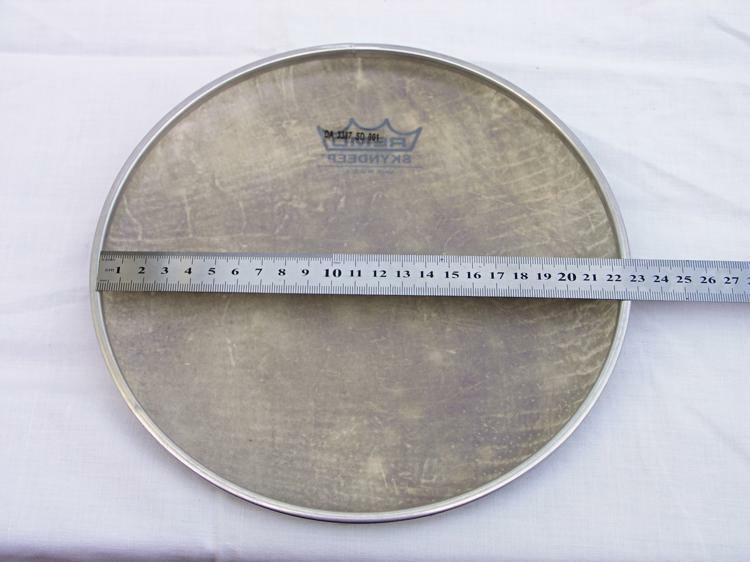 22.50 cm - will fit most standard size Darabuka drums. 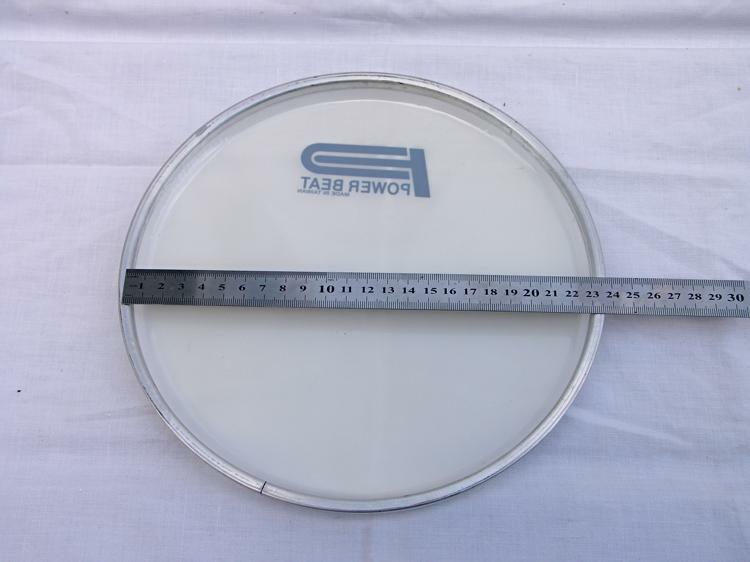 22 cm - will fit most standard size Darabuka drums. 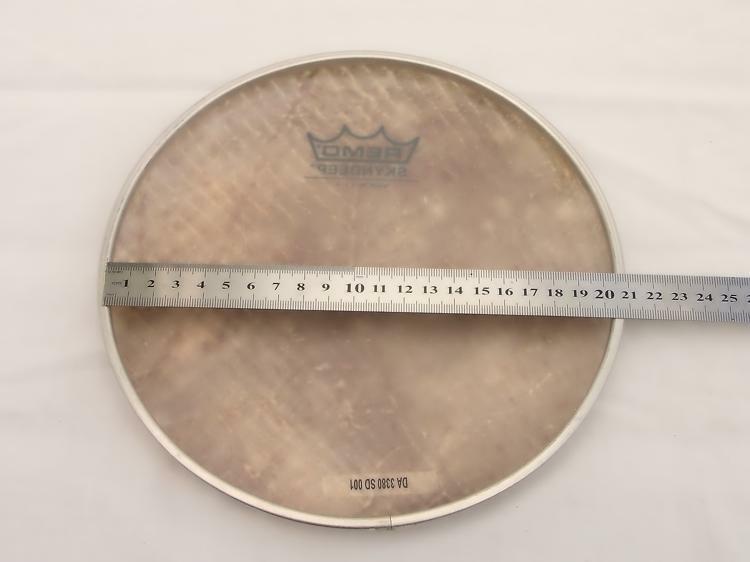 22.2 cm - will fit most standard size Darabuka drums. In Black or White. 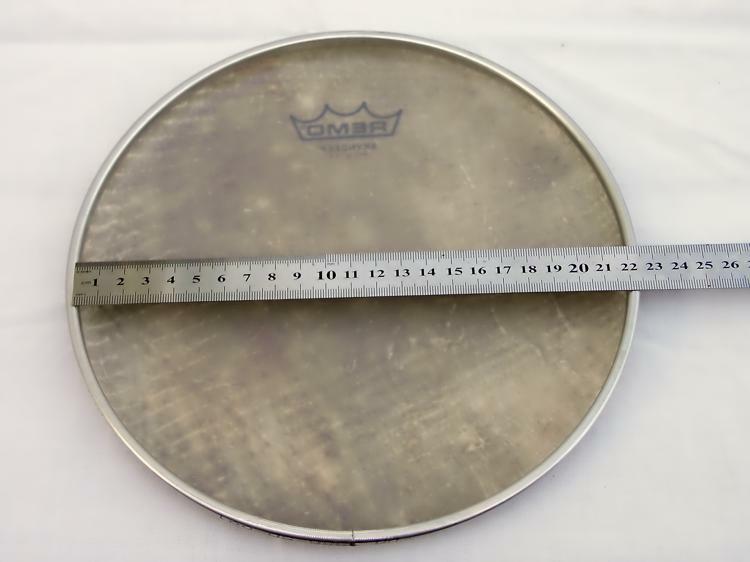 22 cm ( approximately ) - will fit most standard size Darabuka drums. Clear / Blueish. 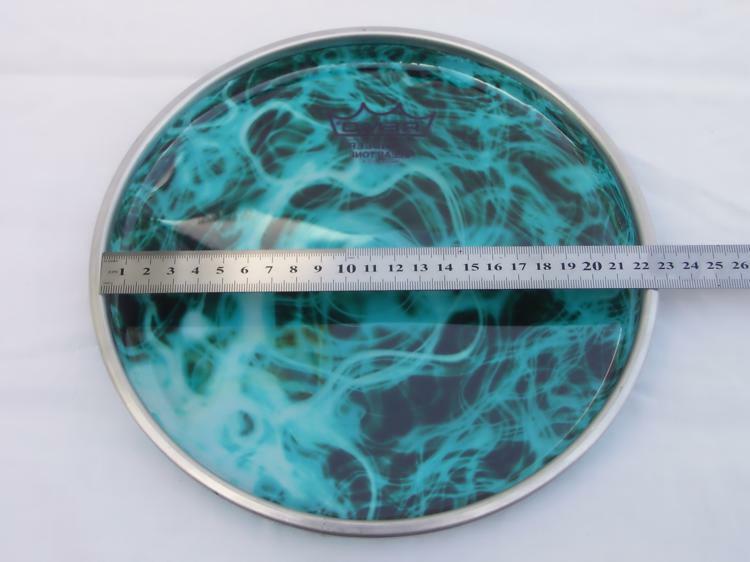 20.5 cm / 8" - will fit most standard size "4-Bolter" Darabuka drums. 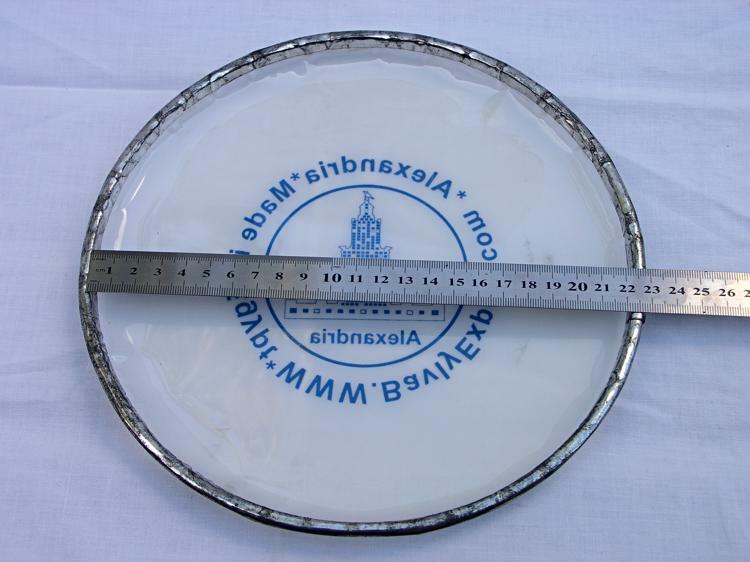 20cm. A smaller fit to the above "4-Bolters". 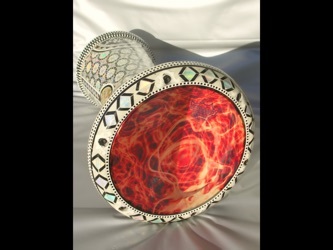 Suits some Turkish drums.